A common scenario, where the presenter and the Viewer want to switch screen. In premium version ShowMyPC now has a simple way to Switch the Presenter during a meeting. 1) While a session is in progress any user can become a presenter. "Options" > "Make Me Presenter"
2) Rest of the users, can click "Options" > "View New Presenter"
During a meeting, follow the same process to keep switching the screen between users. This feature is available in premium version 3160 and up. Currently available in Windows Version only. How to do mutual screen sharing? In a case where both users want to share screen with each other, please follow these steps. 1. 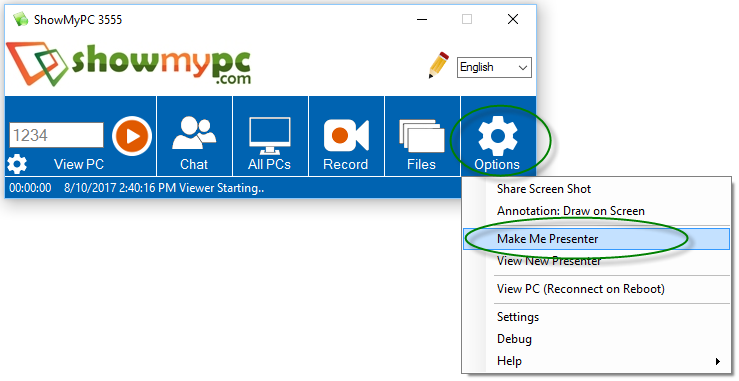 Both users will start sharing by clicking ShowMyPC Now on their own PCs. 2. Both users will share the password with each other. 3. At any point if you ready to View other users PC, click on View Remote PC and enter that users password. Important: Make sure you minimize the Viewer of the other users PC, else you will see your own screen, resulting in mirror effect (multiple screens).